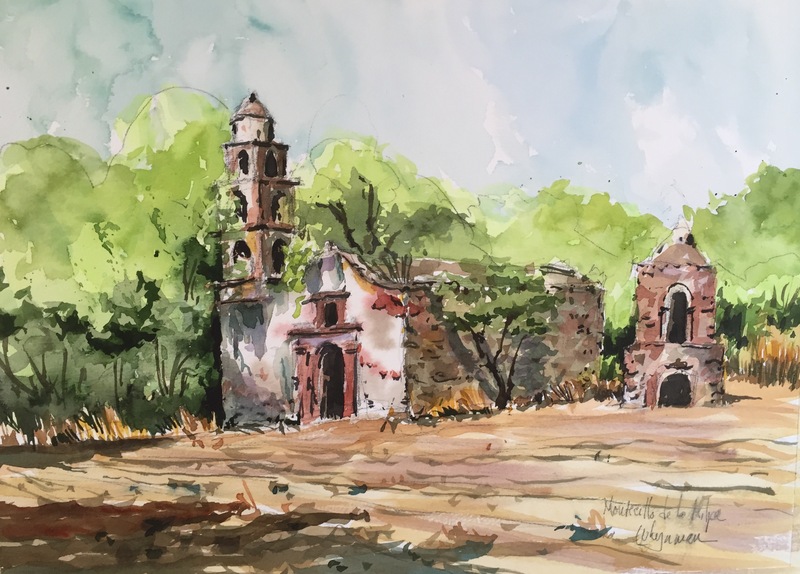 Last week we spotted two capillas across the road from each other and decided, today, to paint the view, from across a newly plowed field, of the abandoned Capilla San Isidro Labrador. Our choice of sites is always helped by finding welcoming shade from the uncomfortable, hot May sun in this part of Mexico. This capilla is in or near the rancho Montecillo de la Milpa (population: 380; dwellings: 90; 1870 meters; GPS (100°48′ 26.96″ W, 21°01′ 46.95″ N). Monticello de la Milpa was founded in 1811 and, in addition, to the two ruins of capillas across the road from each other, there is a third abandoned capilla, as well as the principal iglesia for the community. For additional information in Spanish about this community, check this government link, Montecillo de la Milpa, San Miguel de Allende. Before starting, we tramped across the unplanted field for a closer look and found paintings of symbols from the passion of Christ in a Mexican folk art style decorating the ceiling and still in reasonable condition. Most surprising was a mesquite tree that has grown into the interior wall twisting torturously from the ground to the ceiling like a snake before finally leafing out across part of the roof. Gardeners working on a nearby estate confirmed that there was a major flood here in 1955 that coincides with the time when this capilla was most likely abandoned. The Laja River, bone dry in May, is immediately behind the capilla. The unusual two-story calvario next to the capilla remains partially buried from the 1955 flood. Our friend and neighbor, Kambria Anton, accompanied us for the morning painting outing adding the medium of pastel and her photography expertise to our watercolor sessions. This is beautiful and inspiring. Thank you for sharing it. You are both very talented! Your talent never ceases to amaze me. This is a wonderful book.